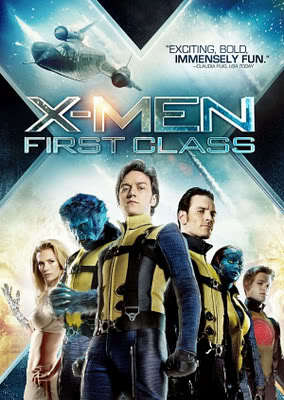 X-Men: First Class Movie is a series of the 5th of the movie X-Men after the X-Men trilogy and X-Men Origins: Wolverine. X-Men: First Class is the prequel of the X-Men trilogy set in the 60s when Charles Xavier and Eric Lehnsherr / Magneto is still young. Like the four previous series, the film adaptation of the Marvel comic is also predicted to be as successful as the previous films. Film-film adaptation of the Marvel comic is much demand and has proved more successful even in the year 2011 alone 4 movie Marvel is ready to call it aired Thor (already aired last May and had topped the box office), X-Men: First Class (aired June 3 of this), Captain America: First Avenger (aired in July), and Spider-Man 4 (TBA). X-Men: First Class Movie tells of the friendship of Charles Xavier (played by James McAvoy) and Eric Lehnserr (played by Michael Fassbender). Their friendship eventually dropped out due to disagreements. Charles then formed the group X-Men while Erick formed Brotherhood of mutants. In addition to Professor X and Magneto, another character known in previous X-Men series is Dr. Henry "Hank" McCoy, aka Beast (played by Nicholas Hoult) and Mystique (played by Jennifer Lawrence). Antagonist character in this film are a group of Hellfire Club, chaired by Sebastian Shaw (played by Kevin Bacon) who has the power to absorb the kinetic energy weapon fire and then use it to increase strength and speed. The second Harry Potter film is better than the first, not because it is true to the book's story, but because it is true to the book's atmosphere. The first Harry Potter movie was very good, but it stayed so close to the book that it spread itself too thin trying to get at every single detail. This adaptation of Joanne Rowling's second book (which I think is the weakest among the entire series) does indeed have all the good parts but focuses primarily on the main storyline. The film skips a lot of the background details, which makes for effective pacing, while taking liberties with the story to fit the big screen. Here Harry Potter (Daniel Radcliff) and his friends, Ron (Rupert Grint) and Hermione (Emma Watson) once again encounter Voldemort (Christian Coulson) as a memory that has the power to become real. Voldemort opens the Chamber of Secrets freeing a fearsome Basilisk, an Alien-like snake that can kill with a glance. The snake's attacks threaten to close down Hogwarts School and Harry must stop them or be sent home to live with his foster parents (you can understand his motivation when you meet them at the introduction of every book/film). 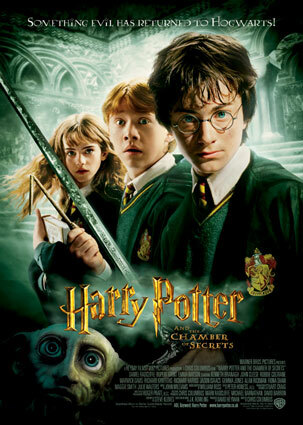 The film is darker than the first, with scenes that are definitely creepy: Harry's encounter with a strange hand in Diagon Alley, Ron and Harry getting stuck in a willow tree that attacks them with its branches, Harry and Ron escaping from the giant spiders, and Harry's final battle with the Basilisk. There are also some Orwellian themes touched upon here, including Dobby the Elf's masochism and slavery, the ideal of some of the "Purebloods" to cleanse Hogwarts of the "Mudbloods". The familiar high-profile cast do a fine job, with the newcomers, Kenneth Branagh as the pompous (and hilarious) new Dark Arts teacher Gilderoy Lockhart, and Jason Isaacs as an evil-oozing Lucius Malfoy, particularly standing out. While the child actors carry their roles well, some of them do tend to overact. The score does a great highlighting the suspense, which there exists a lot of. The set design and accompanying cinematography and production deserves a paragraph of its own. The integration of computer generated images and the actors is very seamless. The Hogwarts school, the surrounding countryside, and the brief Quidditch match are all rendered with amazing reality. If the first film was the setup, this one's definitely the payoff. Even though I know what happens next, I can't wait to see it. “Kung Fu Panda” is the story of a fat (is there any other kind?) panda that dreams about being an awesome kung fu warrior, and when given the chance, rises to the occasion. 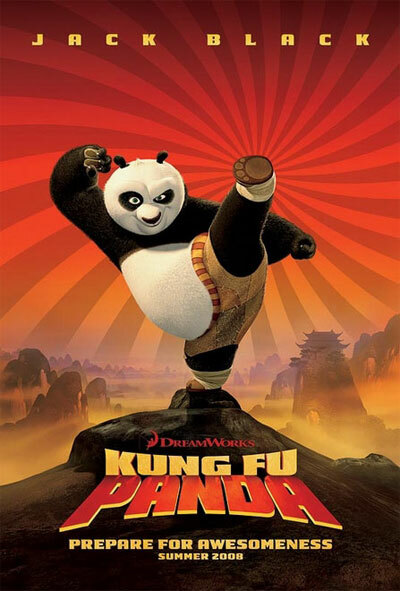 In-between those moments, we get plenty of fat jokes at the panda’s expense, and enough cartoon kung fu violence to, possibly, convince parents this may not be the right movie to be taking your very impressionable kids. Especially if said kids have a bad habit of using little sis as a punching dummy to try out his new “moves”. The above said, Dreamworks’ “Kung Fu Panda” is a fun little movie, although “little” may be a bit of an exaggeration. Take a look at the voice cast: Jack Black as Po the panda, Angelina Jolie as Tigress, Jackie Chan as Monkey, Dustin Hoffman as Shifu, and of course, the always incredible Ian McShane (of Deadwood fame) as the villainous Tai Lung. Which reminds me: I was never really sure why Tai Lung was supposed to be such a villain; as far as I can tell, his only qualification for the mantle is that he’s really good at kung fu, and he really, really wants that kung fu scroll that, when read, will endow the reader with incredible kung fu mastery. But to hear the movie talk about him, you would think the guy went around eating babies or some such. Season of the Witch is a 2011 American period action film with supernatural elements and directed by Dominic Sena. 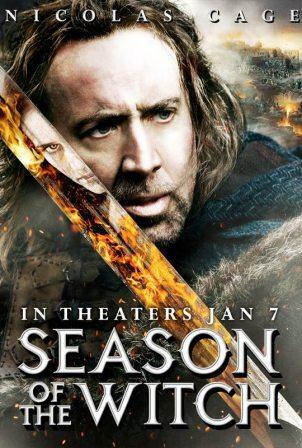 The film stars Nicolas Cage and Ron Perlman as knights who return from the Crusades to find their homeland ruined by the Black Plague. A girl is accused of being a witch and causing the devastation. The film will be released on January 7, 2011. Many years have Behmen (Nicolas Cage) and Felson (Ron Perlman) lives in battle. Sharply honed instinct they have their instincts as a fighter while also not be underestimated. Unfortunately, the two soldiers of the Crusades was not aware that they face a task that would have proved far more terrible than a battle they've ever experienced. How disappointed Behmen and Felson when returned to their hometown and found their shattered homeland ravaged, not by enemy but because of an outbreak that has swept the land. Rarely can survive the deadly plague and the only hope left is Behmen and Felson. Church and Felson Behmen ordered to arrest and bring a young girl named Anna (Claire Foy), who was accused as the cause of the horrible plague to a monastery for this plague to an end. Anna should follow a cleansing ritual that will end the storm that has engulfed the death of the entire European continent. Behmen and Felson not alone. There was a priest named Debelzaq (Stephen Campbell Moore), a soldier named Eckhardt (Ulrich Thomsen, a con man named Hagamar (Stephen Graham), and a young man named Kay (Robert Sheehan). None of them are aware of how much danger would they face in bringing Anna's journey into the remote monastery. And no one knows who the real Anna. 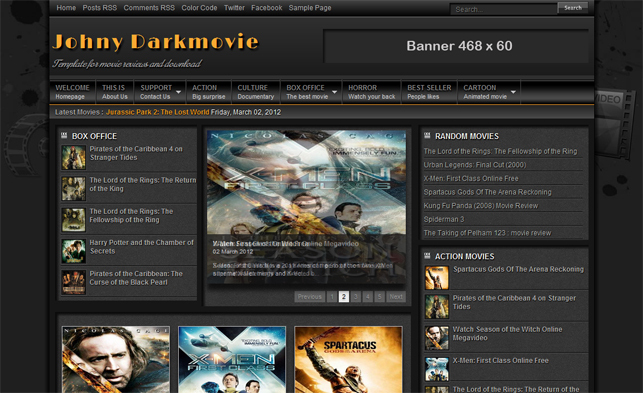 Properties : 2 columns, Ads Ready, Banner, Black, Fixed width, Header Banner, Homepage Slider, Magazine, Menu Links, News, Top Navigation Bar, Movie Template. Özellikleri: 2 sütun, Reklamlar Hazır, Banner, Siyah, Sabit genişlik, Başlık Banner, Anasayfa Slider, Dergi, Menü Bağlantıları, Haberler, Üst Gezinti Çubuğu, Film Şablon.